GM’s November 2018 announcement that they would end production of the Chevrolet Volt plug-in hybrid (PHEV) and the made in China Cadillac CT6 PHEV (at least for the US market), generated a firestorm of articles, speculation and comments around the future of the plug-in hybrid electric vehicle. PHEVs can meet the needs of a lot of driver’s daily trips on battery-electric power, they eliminate the need for heavy, large and costly battery packs only used occasionally for long trips and they serve as a great transition powertrain for consumers not ready or able to buy a BEV. I fall into the second camp and outline 10 reasons below why PHEVs are far from dead and should continue to play a key role in the transition to pure electric vehicles for perhaps the next 7 years or more, especially in the US. 1. PHEVs remain some of the top-selling EVs in the US and around the world: Six of the top-selling EVs in the US in 2018 were PHEVs (counting the BMW i3 as a BEV). And while while many of these PHEVs have annual sales in the US of less than 2,000 units, five sales of at least 5,000 units in 2018. Additionally, consumers simply have more PHEV options than BEV in the US as there are roughly twice as many PHEVs available (27) as BEVs (13). And 4 of the above 6 PHEVs had sales above 1,000 units per month in Q4 of 2018 (chart below). 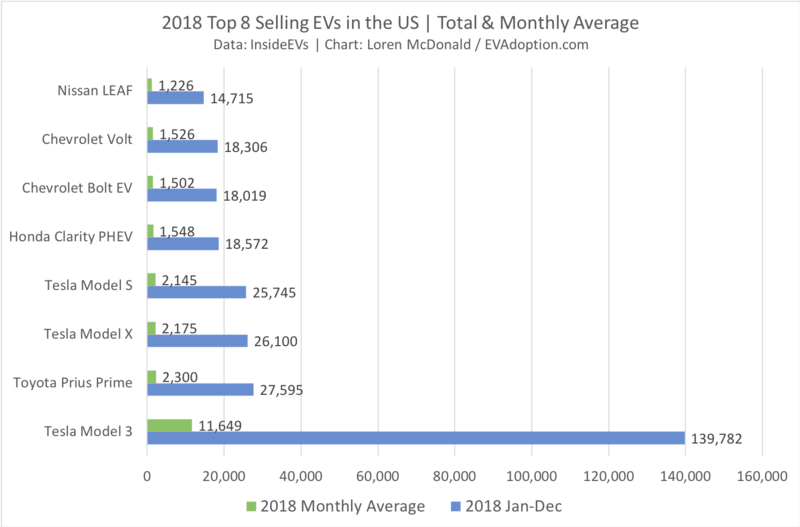 While by mass market standards that is a tiny volume, it is a respectable number for EV sales in the US. As the chart below on recent European EV sales trends from from EV-Volumes shows, the shift to consumers buying more BEVs than PHEVs is underway. For all of 2018, BEVs comprised 56% of European EV sales, but Q4 saw a huge increase to 65%. This shift will only increase as Tesla Model 3s arrive in Europe in signifiant numbers. That said, even if PHEV sales in Europe decline to around one-third of total EV sales, that is still a significant percentage of the market and cannot be ignored. 2. 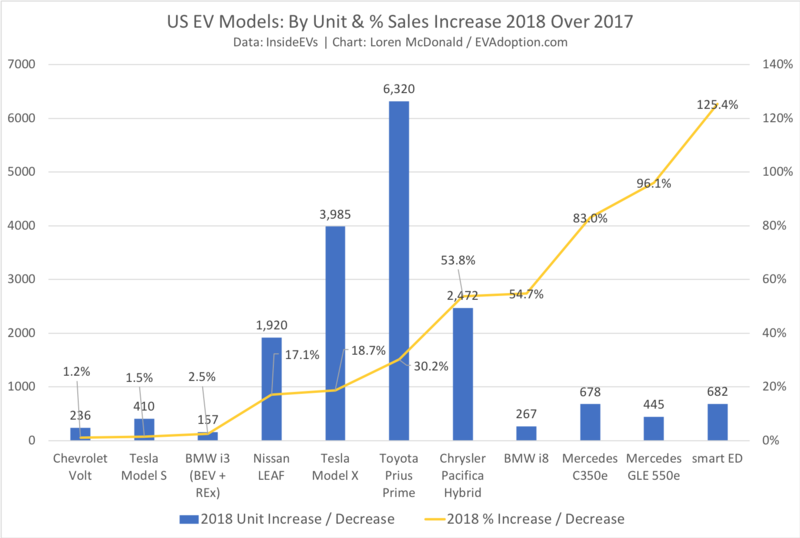 Toyota Prius Prime, Honda Clarity and Mitsubishi Outlander PHEVs continue to be popular: While the Tesla Model 3, S and X, along with the Chevrolet Bolt and Nissan LEAF grab the majority of the headlines in the US, the Honda Clarity PHEV and Toyota Prius Prime PHEV will likely battle it out in 2019 for the #2 spot in sales ranking for EVs behind the Model 3. Among the top 8 selling EVs in the US, the Honda Clarity and Prius Prime had strong YOY growth in 2018, though the Clarity PHEV was not available the entire year in 2017, so like the Model 3 increase, it isn’t an accurate comparison. Prius buyers are also switching to purchasing the Prime PHEV version over the regular gas version. And the Prius Prime had highest YOY increase in unit sales for 2018 versus 2017 of EV models available all of 2017 and 2018. In Europe, while the Nissan LEAF, Renault Zoe and BMW i3 BEVs were the top selling EVs, the Mitsubishi Outlander PEHV continued its strong showing in 4th place. 3. 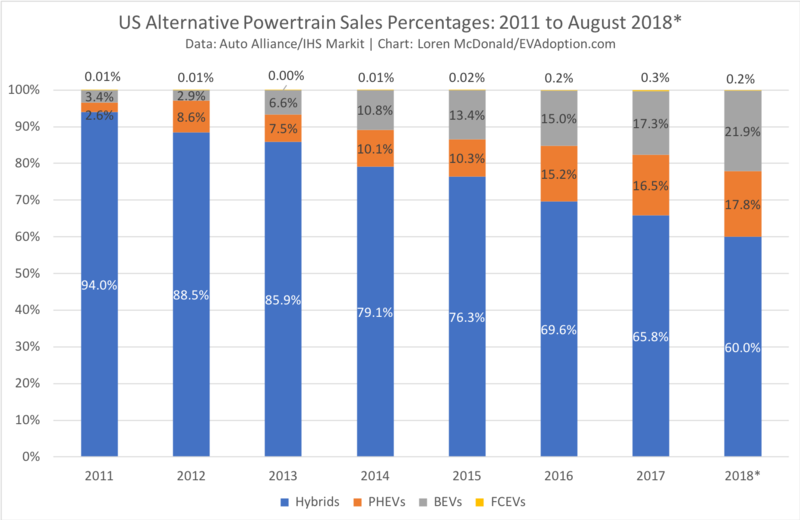 Shift to PHEVs from Hybrids: There is a significant shift away from regular hybrids to both plug-in hybrids (PHEVs) and BEVs, especially in early adopting markets such as California. 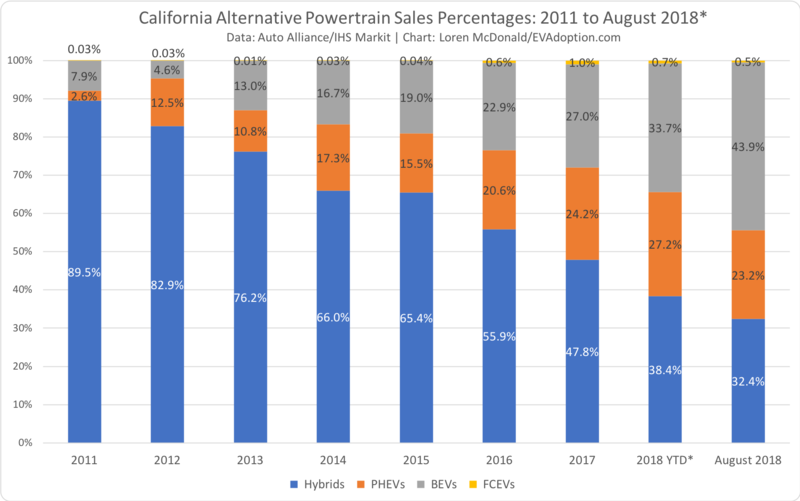 California, which accounts for more than 50% of EV sales in the US, has shifted away from buying regular hybrids, with BEVs alone now outselling hybrids. 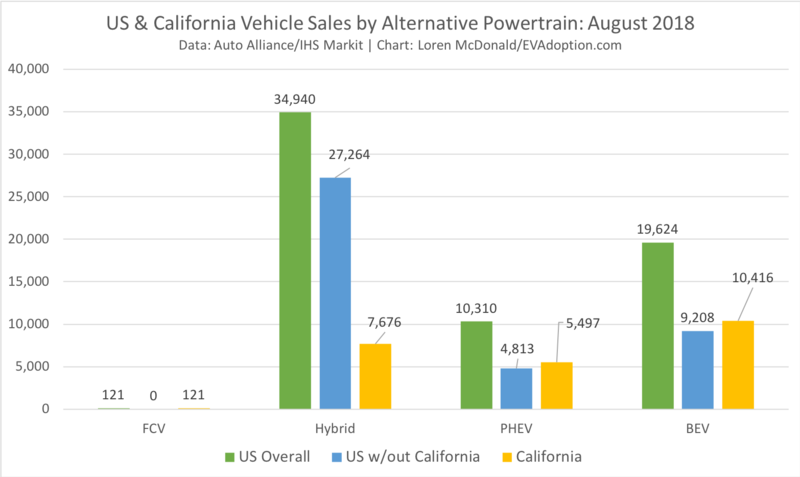 But PHEVs still comprise about one quarter of alternative powertrain sales in the golden state. The dramatic growth in BEV sales in California is due to one model, the Tesla Model 3. California consumers will continue to lead the way in the US in buying BEVs, but the popularity of the Prius Prime and Clarity PHEV in the state will keep PHEV sales strong for several more years. The Prius Prime was the top-selling PHEV and second-highest selling EV overall in the US in 2018, behind only the Tesla Model 3. And it was 1 of only 4 EVs that averaged at least 2,000 units sold per month. 4. Many more PHEVs are still coming to market: Between now and 2022 my analysis forecasts at least 16 new PHEVs will be introduced into US the market. (View sortable table of future EVs expected in the US.) And while that is many fewer than the 48 BEVs expected to reach the market, PHEVs will still be widely available. By the end of 2022, I anticipate between 40-45 PHEVs will be available in the US, versus about 50-55 BEVs. Though some automakers such as Volkswagen are going all in on BEVs, some such as Subaru, Honda, Toyota, Mazda, BMW, Jeep and others may continue introducing new or upgraded PHEV models in the next few years. Jeep in fact is aiming to have 10 PHEV models (and 4 BEVs) available by 2022. 5. Ford Escape PHEV: In 2019 Ford is updating its Escape small SUV/CUV and is expected to include a PHEV variant. The Escape will be launched as a 2020 year model perhaps in the summer of 2019. Few details are known yet, including battery pack size, range and cost but if the escape has a respectable range of 25-30 miles and is within $5,000 of comparable non PHEV versions, it could be a strong seller. Why is the Escape so important? The small SUV/CUV segment is perhaps the hottest segment in the US with Toyota RAV 4, Nissan Rogue, and Honda CR-V ranking 4-6 in US sales in 2018. The Escape came in a disappointing 12th, but still sold 272,000 units. A competitively priced Escape PHEV with solid range could generate solid sales in this hot segment. 6. PHEV Range is Getting Longer: Members of the anti-PHEV gang often cite that the range of BEVs continue to increase as battery technology advances and battery pack prices decline. True. But what they forget is that the same is true for PHEVs. More range is possible for smaller battery packs in PHEVs that are also benefiting from improved energy density and lower costs. Mitsubishi Outlander: An expected battery pack increase from 12 kWh to 13.8 and increase in range to about 25 miles from 22. BMW X5 xDrive 45e: The X5 is rumored to arrive in 2020 with 50 miles of electric range. BMW 330e: The upgraded 2020 model will have 12 kWh battery pack which is a significant increase from the prior 8.8 kWh pack. No official EPA ranges yet available, but estimates peg the new model to have 21 miles, a 50% increase over the previous 14 miles. Volkswagen Passat GTE: Battery pack will increase to 13.0 kWh from 9.9 kWh and range rise to 35 miles from 25 (on the WLTP standard) for this sedan available in Europe. As such, in the next 2-3 years we might see the mean and median range of PHEVs reach 25-30 miles with at least 10 in the 30+ mile range. 7. Commuters with access to workplace/school charging: People with typical commutes of less than 40 miles (64 kilometers) and who can plug-in at their workplace or school and re-charge for the return trip home. This allows them to do their daily commute in 100% electric mode and charge their PHEV while it sits parked all or most of the day. 8. People without easy access to home/overnight charging: Drivers who live in apartments, flats or condominium complexes or other situations where they don’t have reliable and regular access to charging stations – always have a back-up gas engine if they’re unable to charge at work, school and retail and other locations. This group can also include those who only have access to Level 1 charging at home, work, or school. With only Level 1 charging it may take too long to charge a BEV with long range, whereas only having to charge 15-50 miles in a PHEV may be more acceptable. 9. Rural drivers, frequent road trippers and late adopters: PHEVs can be an attractive option to drivers that do a lot of long, e.g., 300-400 mile (483-644 kilometer) trips especially in areas and without many fast charging stations on their route. A PHEV meets their electric-only needs around town, but then the gas engine solves eliminates the need to find and charge fro long durations while out on very long trips. Secondly, people living in rural areas or other markets where fast charging and Level 2 stations are simply not that that prevalent can make mid-range and longer trips inconvenient in a BEV. Finally, consumers who for whatever reason like the idea of electric cars and plugging in, but just are not ready or financially able to buy a BEV, but where more affordable and adequate plug-in hybrid meets their needs. 10. Federal EV tax credit for several PHEVs equals or is close to that of the BEVs: One of the little known facts about the Federal EV tax credit is that EVs only need a battery pack of 16 kWh to qualify for the full $7,500 level of the tax credit. (See chart below on how the credit is calculated and 6 examples). Currently 3 plug-in hybrids qualify for the full $7,500 tax credit: the Chevrolet Volt (which is being discontinued in 2019), the Honda Clarity PHEV, and the Chevrolet Pacifica minivan. Additionally a few PHEV models are overdue for battery pack upgrades and are not unrealistically too far away from reaching that threshold. In particular as I wrote in Toyota USA Perplexed On What To Do With the Prius, the 25 mile range Prius Prime, which is selling well especially when compared to its non-plug-in sister models, needs to increase its range in order to better compete with the Honda Clarity which has nearly double the range at 47 miles. Also, the Mitsubishi Outlander PHEV has a current back pack of 12 kWh and is expected to increase to 13.8 in 2020. While that falls short of the 16 kWh target, it will increase the SUV’s tax credit amount to $6,587. What do you think? What does the future of PHEVs look like? ← Would A Pure Electric (BEV) F-150 Be A Mistake For Ford? I had the 2nd mindset referred but now I have the first, at least for families (that need 2 cars), because I think is best to have 1 car full electric and other full combustion, rather than just 1 more complex PHEV to cover daily commute and long trips. Or why not both (BEV + PHEV)? Lots of combinations that will work … but PHEVs I think are still a great option for many. PHEV still makes a lot of sense in much of America where recharge stations are scarce or slow. Most people can reduce fuel burned by 50 to 90%. Part of the problem is also limited choice outside carb states because many models are not marketed nationwide. After having a couple standard hybrids I did not find the ‘complexity’ of gas and electric power to cause undue maintenance expense. Thinking i3 rex looks good for next car. If there were really a mass exodus to pure BEV over next 5 years I doubt enough batteries could actually be produced to support the industry anyway. 2 PHEV vehicles running 75% electric save more fuel than 1 BEV and 1 ICE while using less of the resources needed for battery production. Rocky, thanks for the comment. I generally agree, I’m a fan of PHEVs during the transition especially or people who are reticent to make the switch, have short commutes, etc – a perfect solution. And it does seem that battery supply is a huge challenge the next few years for the OEMs. But once we get past that in 4-5 years, battery pack prices come down, range average 300 miles and the cost difference between BEVs and ICE is only a few thousand dollars, we will likely see the switch to BEVs pickup pretty dramatically.